I think my situation is a little unique. Growing up, my brother and I were not allowed to own a motorcycle. A family member had died in a bike accident, so we were highly discouraged. We weren’t discouraged from motorized adventure though, we raced boats and cars (drag and circle tracks) and loved speed and thrills. My total motorcycle experience was a few rides on friends bikes. In the early 1980’s I was a service member stationed in Germany. I was in a rural area, so I did not see a lot of it, but I did notice that scooters (not motorcycles) were a big part of the transportation system. Over the past couple of years I have vacationed in London, Paris and Berlin. I was amazed at the efficiency of the transportation systems in those cities. At the same time debate rages on about 280, I-65, and the transportation problems in Birmingham (Atlanta, Nashville …). In the major European cities public transportation and scooters dominate travel. Cars are limited to the very rich or commercial travel. The laws favor scooters and encourage two wheelers (filtering city law makers!) to solve congestion and parking problems while maintaining some individual freedom. So although my travel and pocket expense were not prohibitive to me here in Alabama, I started looking at what I would do if gas prices started to climb. I looked at bus routes to see if I could drive to the closest station and bus back and forth to work. It might be feasible if you work 8 to 5 in the city center, but I work 7 to 7 in Hoover. With Birmingham’s pathetic bus schedule it was not possible. Next was riding a motorcycle or scooter. I was 51 years old and had never ridden. I had seen middle age guys find the romance in a bike, go out and buy a Goldwing, get scared the first time they pulled up the kick stand and never ride again. I decided to start small. 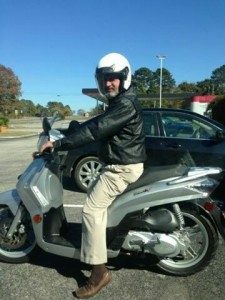 In September 2013 I bought a Roketa 150 (Chinese scooter) that needed work for $400. I played around with it, learned to ride, played with performance parts and had some fun. However, it topped out at 52 mph by GPS. Anywhere I travel requires riding on Interstate or 2 lane roads with 55 mph speed limits. There was always someone on my rear fender. Travel time to work was 1 1/2 hours by the roads I had to take (45 minutes by Interstate in my truck). I did learn about scooters and found that I enjoyed the ride. It was worth the money spent for the experience and education. I started looking for a 250. While searching I came across a Kymco People 200S. It was a great deal on a low mileage clean scooter, but it wasn’t running right. I little wire work and carb cleaner (a $5 investment and a few hours) and I had a great running bike. Now I really enjoyed the ride. It topped out at 62 mph (by GPS) so the 55 mph roads were no problem. The ride to work was down to a little over an hour and more places were available to ride. From mid November 2013 to Mid February 2014 I put 1000 miles on her, even though weather was not very cooperative! Since it was not fast enough to safely drive on the Interstate, Also, I was pushing the 164cc so hard that my gas mileage was only in the low to mid 50’s mpg. it would not help me achieve my goal of averaging riding to work 2 days a week. I started looking for a 250 (Reflex, Rebel) or larger again. I came across a nice deal on a Suzuki Burgman 400. I have had it less than two weeks and have put 500 miles on it. There would be a few hundred more if it would stop raining! Interstate speeds are no problem. Back roads are fun. It is comfortable in a 1 hour ride. My commute to work is 454 minutes if I want it to be, a little longer if I want to have some fun or feel more safe on the back roads. My gas mileage is in the mid 50’s. I am new at this, so only time will tell if I get bored commuting on it and go to just enjoying weekend rides. So far, riding the scooter has been adventurous and fun. For those inexperienced or first time older riders, I highly recommend starting small and light, having a CVT helps a lot too, so that your first two wheel experiences are something you can grow with!